Yossarian does everything he can to avoid having to fly another mission. He has been in and out of the hospital with real injuries and fake diseases. He has been asking everyone he knows if they could ground him, but no success. His (and others’) attempts to get out of flying get more desperate as the war increases. Yossarian is stationed on a fictional island outside Italy during World War II. The number of flights they have to fly increases every time they have reached the limit and no one, despite how crazy they are, is sent home. And the fear of flying increases as they watch planes being shot down. How is it possible to write so witty about something so serious as war? Because the book is witty. The situations and conversations they get into as they try to get out of flying are absurd. The characters are spot-on and although I mixed the characters all the time, they really made the book. I also loved the scenes where they were chasing for whores in Rome. On the other hand, I really struggled with this book. I don’t think I have ever read so slowly as reading Catch-22. And I don’t know why. It is really frustrating to read a book of 519 pages when you feel you’re never getting anywhere with it. 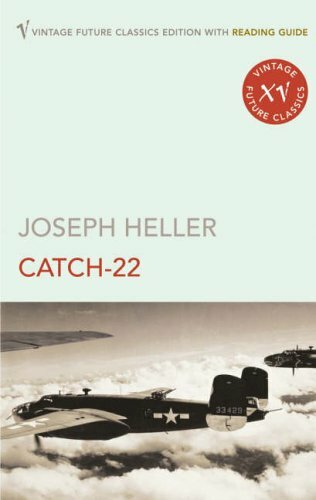 Some of the teachers at work are using Catch-22 as a catch-phrase (and if the students ask what it means they answer read the book. I have also seen it being used in various newspapers and articles and it feels good to finally know what it means!